Ushimado, Setouchi City, Okayama prefecture, is a nice and quiet small coastal community of the Seto Inland Sea with lots of olive trees and sailboats. Yacht harbor is the biggest scale in western Japan. Olive is extensively cultivated at this reagion utilizing the mild climate of the Inland Sea like the Aegean. Shodo-shima Island is known as "olive island". Go up to the olive garden, and you’ll have the fine view of the sea with numerous islands and the mountains of Shikoku. 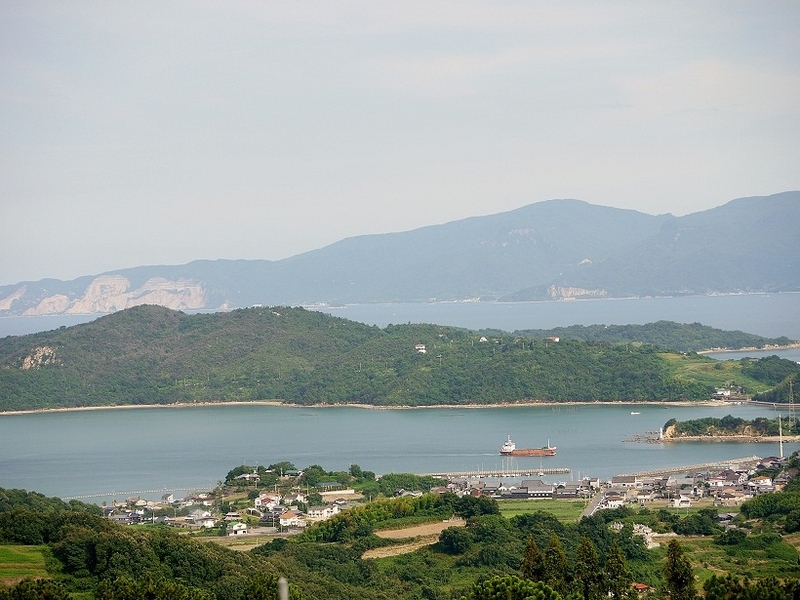 On a sunny day, the color of the Inland Sea is azure. The Sea was shimmering in the lighter color on that day. The small white dots are yachts. This place is close to Shimanami Kaido (island-wave-highway,　しまなみ海道), which connects Honshu (main land, the largest island of Japan) with Shikoku by bridges via several islands of the Inland Sea. The islands are known for their breathtaking scenery, beaches, and olive or citrus cultivation. Some people enjoy pedalling from island to island feeling the wind. On our way, we stopped by an orchard close to the olive garden. These are not strange fruits. 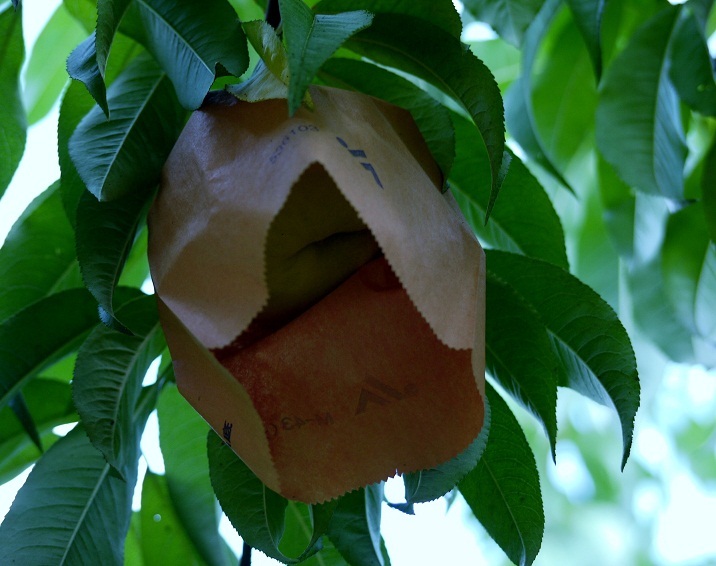 These are small paper bags to protect peaches to ripen to perfection. It's peach season: they are picked between late July and early august. 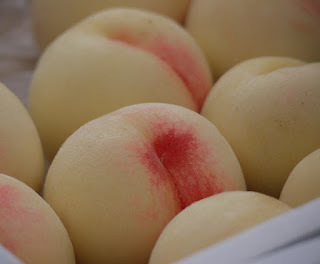 White Peach is one of the specialty products of Okayama. It is well known for its juicy and sweet flavor. The soft lusciousness is exquisite. Fukushima prefecture has produced the most peaches in Japan, however, we can't expect so much on them from Fukushima this year. Back to Ushimado, I was satisfied thoroughly for the picturesque surroundings and landscapes as a traveler, nature lover, and amteur photographer. Still more if you are a sailor, I think. In a couple of dyas, I'll become inactive in blogging and commenting. Stay cool and have happy summer days, Friends. Have a nice obon holiday, Japanese Friends. See you two weeks later. What a lovely place. I had no idea that there were places where olive trees grow in Japan. I loved the atmosphere of these photographs. beautiful scenes. the paper protection on the peaches is neat! love the sweeping whispy clouds in several of your shots. I've been there. Long ago. Time for another visit. Thanks for the reminder. Beautiful post... The third pic looks from a different planet!!! I hope you enjoy your break! I didn't know that Fukushima prefecture has produced the most peaches in Japan. What a sad thing that we can't eat them now. 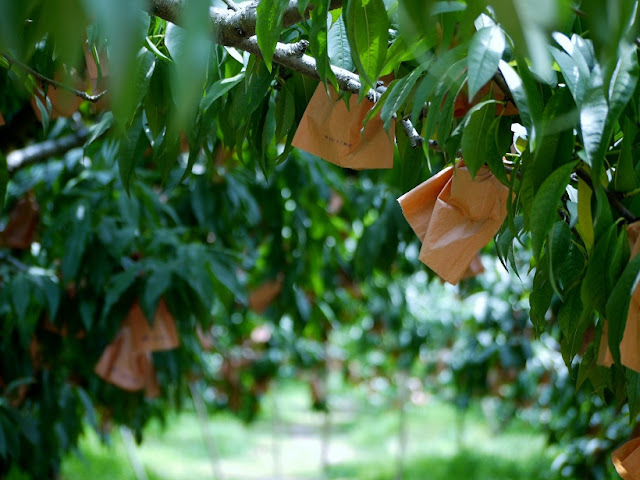 However, we hope the peach farmers will grow delicious peaches and we will eat them again. Okayama's peach looks so beautiful. I have enjoyed your blog and scenes from Japan and Japanese customs very much. A good trick with the paper bags over the peaches. I must try whether that would keep the birds from pecking at mine as well. Very beautiful photos of the harbour. What an exciting post! I never thought that there are olive trees in Japan. And I have also never seen such a fascinating process of growing fruit. 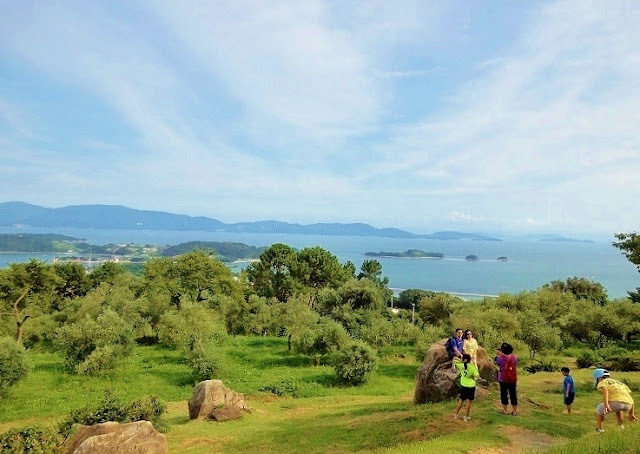 Loved the panoramic view of the islands of the Inland Sea. All the greens and blues of your world are beautiful. Thanks for your visits and lovely comments on my blog! Your world is great and in your life very interesting. I like your landscape. Have a nice vacation. I already have it behind me. Peter. gorgeous, gorgeous photo's and as always, wonderful narrative. the clouds add so much interest to the views here. i can't imagine "bagging" all those peaches in place!! A very interesting topic, we all know about Japanese peaches but don't question where they are grown. The sceneries are beautiful as well. have a good holiday! Wonderful views again, The Islands of Japan are truly beautiful. I'm so sad that I will never see them. Have a lovely holiday. i shall look to seeing you when you get back. What gorgeous photos. I love the photo of the peaches - so sensuous looking. Flawless skin - makes me want to paint! I am visiting from "My World Tuesday." I enjoyed looking at your photos of the beautiful bays and fruit and olove trees. Another beautiful post with stunning captures and such interesting information and background! Always a delight to visit your world each week! Enjoy!! Wonderful post!! Boom & Gary of the Vermilon River, Canada. What beautiful pictures! Those peaches look so juicy and good! thank you for sharing your beautiful coastal world today. I've never been to Ushimado but I have crossed the Shimanami-Kaido by our car. It's most beautiful of three bridge link Honsyu to Shikoku, I think. Like many of us, I didn't know there're olives in Japan. I like olives :) And paper bags! What a brilliant idea. Have a great time, Yoko! I hope you enjoy your summer. 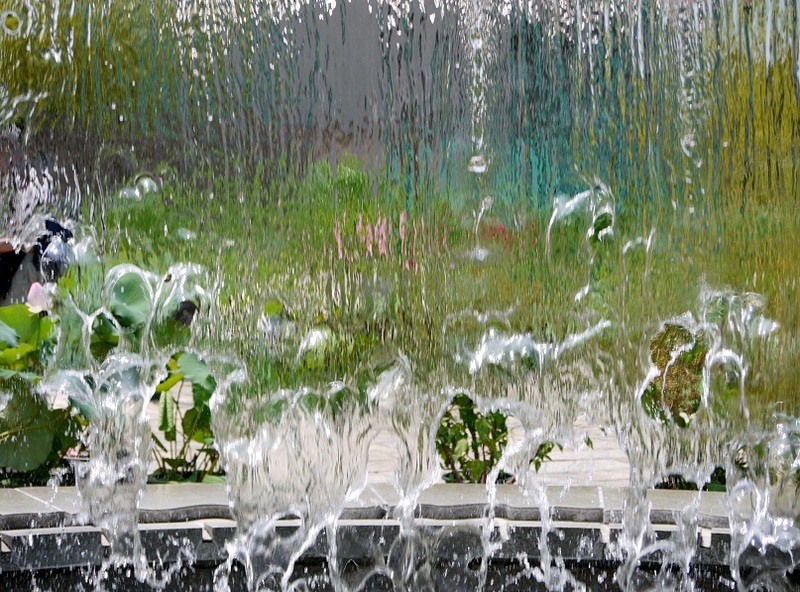 Thank you for this interesting post and these beautiful photos!! Have a nice Bon holidays! What a lovely place!The light is beautiful,one could spend a great deal of time exploring these islands.I like that the peach growers spend time to protect each individual fruit,such dedication to the process and obviously much appreciated. olives, citrus and peaches remind me of the Mediterranean. Hello Yoko, I enjoyed the views from the olive grove. If I'd visit, maybe I'd try biking across those bridges from one island to another. We have wonderful peaches in CO, too, from a place called Palisades which is not too far from me. They have both peach groves and grapes for making wine. I like how the peaches are tucked into their little "hats" to protect them. PS Can't believe your granddaughter is already 8 months! I bet she's precious. I've been off my computer for a bit also - the Grands were visiting. Very beautiful landscape and place. Wonderful pictures!! Everything looks so beautiful, Yoko. Very interesting and much new information. Everything is so different from my country. It looks like a ver y beautiful place. I was amused by the "strange fruit" - I've never seen paper bags on peaches before! Thank you everyone for taking time and leaving a nice comment. Obon is the period when our ancestors’ spirits are believed to come home, so it’s the time for family reunion including the spirits of the deceased. I had a good time. Japan is an island country consisting of four big islands and about 7000 small islands altogether. 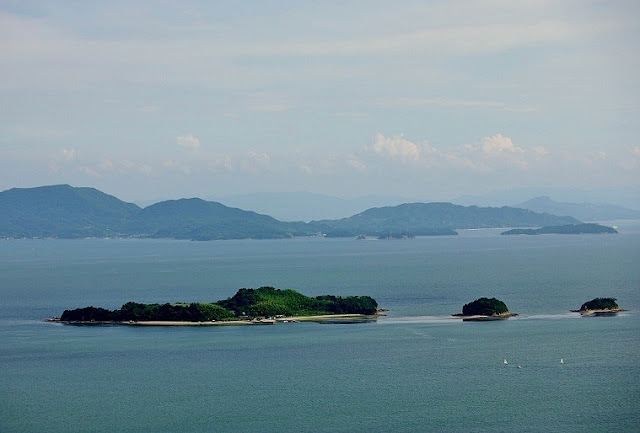 I think Seto Inland Sea is one of the most beautiful Japanese seascape. Nice pictures. A beautiful sky, great scenery.